In 8-inch skillet, melt 1 tablespoon of the butter over medium heat. Stir in bread crumbs. Cook and stir 2 to 3 minutes or until golden brown. Place crumbs in small bowl; set aside. In 1-quart saucepan, melt 3 tablespoons of the butter over medium heat. Add onion; cook, stirring frequently, 4 to 5 minutes, or until tender. Stir in flour salt, pepper and nutmeg. Cook and stir until mixture is bubbly. Gradually stir in half-and-half. Heat to boiling, stirring constantly; boil and stir 1 minute. Remove from heat; set aside. In 12-inch skillet, heat remaining 1 tablespoon butter over medium heat. Gradually add spinach. Cook, stirring, just until spinach is wilted. Stir in half-and-half mixture. Cook and stir 1 to 2 minutes or just until heated. Spoon mixture into serving bowl; top with toasted bread crumbs. Baby spinach is more tender than regular spinach and doesn’t need its stems removed before cooking. 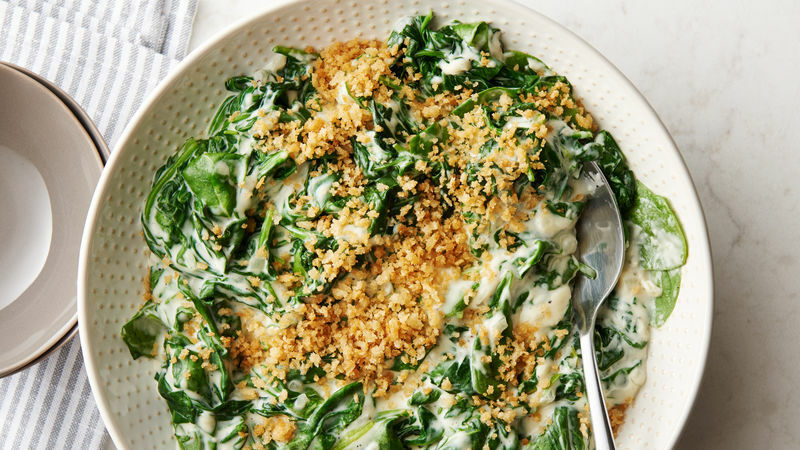 Using half-and-half to make the sauce gives this creamed spinach a luxurious richness.